In honor of Navajo Code Talkers Day this past week on August 14, Government Book Talk explores some Federal publications that utilize American Indian traditions and culture to combat serious problems of the past and present. “Code talkers” became the term used to describe Native American soldiers from various Indian tribes who communicated on radios, telephones and telegraph during World Wars I and II. They spoke in their own languages and dialects, all of which were indecipherable by enemy forces. Because few non-Indians knew these difficult native languages, which in many cases had no written form, they provided ideal codes for relaying secret operational orders. In France during World War I, the 142nd Infantry Regiment, 36th Division, had a company of Indians who spoke 26 languages and dialects. Two Indian officers were selected to supervise a communications system staffed by 18 Choctaw. The team transmitted messages relating to troop movements and their own tactical plans in their native tongue. They helped the American Expeditionary Force win several key battles in the Meuse-Argonne Campaign in France, the final big German push of the war. After the United States entered World War II in December 1941, more Armed Forces used code talking units with each unit composed of members of a specific American Indian tribe. 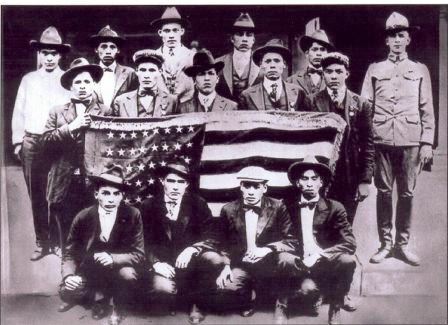 The United States Marines recruited several hundred Navajos for duty in the Pacific region. The Marines chose these Navajos for their ability to speak their native language, Diné bizaad (Navajo), for code talking. Philip Johnston, a son of missionaries who had grown up on the Navajo reservation, originally recommended Navajo to the Marines as a language well suited for cryptology. In a memo to the Commandant of the Marine Corps in early 1942, Navajo was declared uniquely suited to succeed more than some other languages proposed for use. At that time, most Navajos were fluent in their native language. The Marines were lucky; in 1942 only an estimated 28 non-Navajo Americans could speak the extremely difficult Navajo language! Hitler had heard of the possibility of using Native American languages for codes prior to the United States’ entry into the war, and had sent a number of German anthropologists to the United States prior to WWII to learn Native American languages. Navajo was reportedly the only language the German anthropologists had yet to learn. Navajo also benefited by being so unlike other Native American languages that there was no language similar to it. If you’re fluent in Spanish, you might be able to muddle along in Portuguese after some basic lessons. Navajo has no analog. In May 1942, the first Navajo recruits attended boot camp; they then moved to Camp Pendleton in Oceanside, California, to create the Navajo Code Talkers Dictionary. The Marines trained approximately 400 Navajos as code talkers. To relay the messages they were encoding, they had to learn to operate three types of radios. At that time the code talkers called themselves “radiomen”. The developers of the Navajo code modeled the alphabet portion on the Joint Army/Navy Phonetic Alphabet. That alphabet uses words to represent letters, e.g., Fox for the letter F. In the Navajo code, Ne-Ahs-Jah is Navajo for Owl, which stood for the letter O. To spell the word Navy, the code talker might say, “Tsah (Needle, or N), Wol-La-Chee (Ant, or A), A-Keh-Di-Glini (Victor, or V), Tsah-As-Zih (Yucca, or Y)”. The Navajo Marines also chose Navajo words to represent about 450 frequently used terms in the military. It was hard. According to code talker Wilfred Billey, “one of the most difficult parts of forming the Navajo code was using it to relay precise information, such as coordinates or troop movements because several words in the Navajo language have various meanings” (May 22, 2003, “Navajo Code Talker Continues Oral Tradition”, Marine Core Logistics Base Albany). Some of the choices were very creative. Navajo is a classic language that didn’t originally include terms like “tank”, so the Navajo Marines dubbed it “Chay-Da-Gahi”, or tortoise. The Navajo Code Talkers Dictionary, published by the Navy years later after it was declassified, showed the versatility of the code’s creators. The code was so effective in World War 2, it was also used in the Korean War, being phased out before Vietnam. In fact, at Iwo Jima, Major Howard Connor, 5th Marine Division signal officer, declared, ‘Were it not for the Navajos, the Marines would never have taken Iwo Jima’” (Navajo Code Talkers: WWII Fact Sheet). During that battle alone, the radiomen transmitted 800 messages without error. Although the Navajo tribe is the one most remembered for its contributions to the World War II communications code units, the US military also used Basque, Comanche, Sioux, Hopi and a number of other American Indian languages as code languages. Basque was rarely used because there were native Basque speakers in Europe which made the U.S. military wary of using it more widely. However, because the various Army units of Code Talkers were so secret, their very existence was kept classified until the 1970s or later. 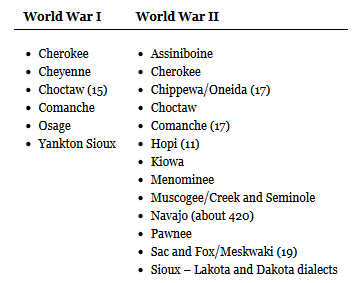 Image: List of American Indian Code Talkers’ languages and the numbers of tribal members who served, if known. There were at least two Code Talkers from each tribe. Source: National Museum of the American Indian’s website. 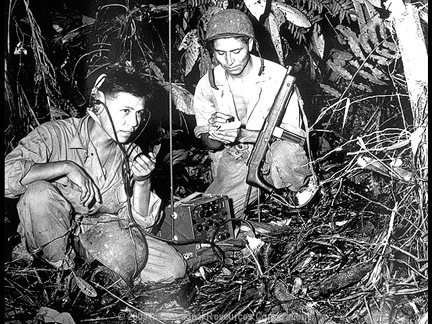 The US Army’s Signal Corps is the military branch that develops, tests, provides, and manages communications and information systems support for the command and control of combined US Armed Forces, including code talkers. You can read the history of the Army Signal Corps in Getting the Message Through: A Branch History of the U.S. Army Signal Corps. The US Army’s 4th Signal Company, also known as the Code Talkers, used seventeen Comanche Code Talkers. Like the Choctaws of World War I, and the Navajos in the Pacific Theater, the Comanche Code Talkers used their native language to prevent the enemies of the European Theater from intercepting messages of the allied troops during World War II. The unit was instrumental during the Normandy invasion. The Hopi tribe also helped in the communications coding efforts. Eleven Hopi men developed a highly secret code language which they used to assist US Army intelligence in the Marshall Islands, New Caledonia and the Philippines during the Second World War. Again, because of the super top-secret nature of their work for Army Intelligence, the Hopi Code Talkers’ contribution was not officially recognized until April 26, 2012, on the inaugural Hopi Code Talkers Recognition Day. The United States Government continues to utilize Native American language and traditions to solve important problems of the day. For example, with the public health issue of childhood obesity and diabetes rising to dangerous levels in the US, the Department of Health and Human Services Centers for Disease Control and Prevention (CDC) Native Diabetes Wellness Program (Wellness Program) and the Indian Health Service (IHS) Division of Diabetes Treatment and Prevention recently teamed up with the Tribal Leaders Diabetes Committee (TLDC) to produce the award-winning Eagle Book series. The developers of this series realized that the old, traditional American Indian diet and activity levels were in line with today’s medical recommendations to eat less processed food and more fruits and vegetables as well as exercising more. Thus, they worked with Native groups to incorporate traditional American Indian story-telling techniques and themes to promote increased physical activity such as walking and playing as well as making healthier—and more natural—food choices to reduce obesity and prevent diabetes. The common Native American theme of the tortoise/ turtle used by the American Indian code talkers resurfaces in the newest book in the series, Coyote and the Turtle’s Dream. In this middle school-age mystery/ adventure book, the wise elderly box turtle helps the mischievous Coyote and the Indian reservation town’s residents solve a mystery to foil the plans of a fossil poacher while teaching the underlying message about healthy eating and increased physical activity. With the first four books aimed at elementary schoolers– Through the Eyes of the Eagle, Knees Lifted High, Plate Full of Color, and Tricky Treats— and the next book for middle schoolers– Coyote and the Turtle’s Dream— the Eagle Book series has been snapped up by teachers, nutritionists, librarians, parents and children’s health providers all over the country as an effective tool to teach children about healthier eating habits and increasing activity while also instilling an appreciation for Native culture which extols respect for elders and living in harmony with nature. How Can I Obtain These Publications? Download eBooks: Every August 14, we honor the service and sacrifice of the Navajo code talkers in WWII. You can find out more about this period in our history by reading the electronic versions of Navajo Code Talkers Dictionary, and the Code Talkers Recognition Act of 2008, both downloadable from GPO’s Catalog of Government Publications. Getting the Message Through: A Branch History of the U.S. Army Signal Corps. Tells the history of the United States Army Signal Corps, the branch from its founding in 1860 through the World Wars up to the Persian Gulf operations. United States Army and World War 2, Asiatic-Pacific Theater (CD-ROM Set) Contains a collection of works on World War 2 from the Center of Military History on the operations and campaigns in the Asia and Pacific theaters. American Indian Book Collection: You can browse our entire American Indians collection of Federal books about Native American peoples, culture, health and history from the Smithsonian Institution, the Department of the Interior, the Department of Health & Human Services, and more. Visit our Retail Store: Buy them at GPO’s retail bookstore at 710 North Capitol Street NW, Washington, DC 20401, open Monday–Friday, 9 a.m. to 4 p.m., except Federal holidays, (202) 512-0132. Find Them in a Library: Find these publications in a federal depository library. About the author(s): Adapted by Government Book Talk Editor-in-Chief and GPO Promotions & Ecommerce Manager, Michele Bartram, from an original blog post by Jennifer K. Davis from GPO’s Library Services & Content Management Division that supports the Federal Depository Libraries Program (FDLP).